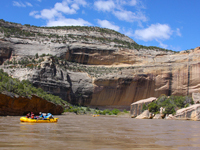 The Yampa River, located in the heart of the Dinosaur National Monument on the Eastern end of the Uinta Mountain Range. The geology of the Yampa Canyon begins with layers of sandstones, limestones and shales, giving the viewer a unique "look back" at the rising and dropping of an ancient sea. As you travel further into the canyon the sheer walls of the Weber Sandstone become predominant. As the river winds its way through a maze of walls sculpted by windblown sand, walls, such as the 1,000' high Grand Overhang and the stripes of the Tiger Wall will leave the viewer in awe. Once you leave the Yampa Canyon and join the Green River, entering into Echo Park, the Mitten Park Fault will blow the viewer away. Just after Mitten Park the river enters into Whirlpool Canyon the billion-year-old Uinta Mountain Group formation and the Unique Sea Stacks enter into the geologic picture. Following a leisurely float through Island Park and the Morrison Formation (where dinosaur bones are found), the river makes a dramatic cut right through the Split Mountain Anticline. 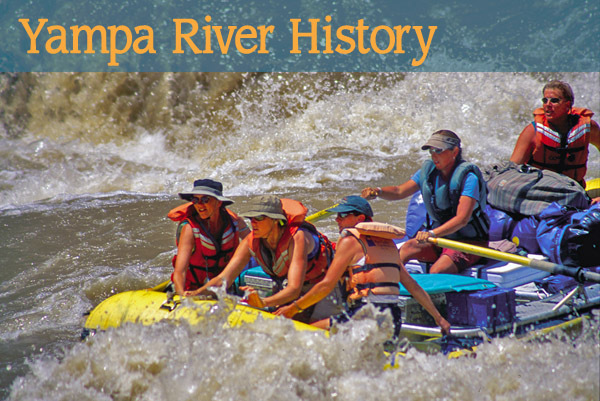 More Information on the Yampa River Rafting History.